Promotional ballpoint pen with stylus and wax gel highlighters will make your brand name a priority for your young recipients and their parents. 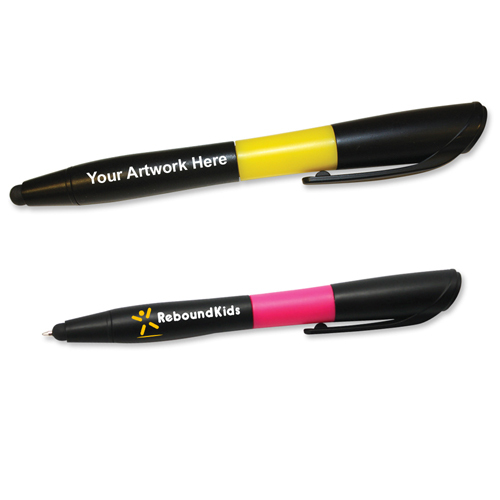 These 3-in-1 promotional writing accessories include a gel highlighter and a ballpoint pen with a stylus. These promotional mini highlighters are ideal for school promotions, tradeshow giveaways, campus bookstore promotions, art and craft store promotions and more. Available in black with vibrant color highlighters, you can easily select them for your next promotional event. Order today to get started with these promotional giveaways for kids at guaranteed low prices! Request a quote to know discounts that you can avail on bulk ordering these custom ballpoint pen with stylus and wax gel highlighters. Imprint Area: Highlighter - 3/4" X 1/4, Pen - 1 1/4" X 3/8"